Are family traditions the glue of strong families? Shared traditions and experiences are often part of the glue of strong families, creating positive memories and warm emotional experiences that can last more than a lifetime. These are the stories, beliefs, rituals and customs that are passed from one generation to the next. Research shows that traditions can foster a sense of belonging, and a sense of continuity and routine that can be depended on. In today’s world, where you can buy a hot-cross bun in January, and Christmas decorations in October, special traditions or experiences that occur only once a year are increasingly unique. Rich, familiar, special, eagerly awaited traditions can be a settling experience, bringing a moment of calm which contrasts beautifully to a daily life that may be full of constant change and business. What are the traditions of your family? For many families, traditions are changing. While that brings relief for some who have endured traditions that may not fit their values, for others it may bring grief and a sensation of loss. The pace of change of everyday life used to be much slower – many family traditions changed little across generations. Indeed, even enduring traditions was a shared experience for many! Some traditions have become simpler – Saturday night is pizza night – and some have been lost. 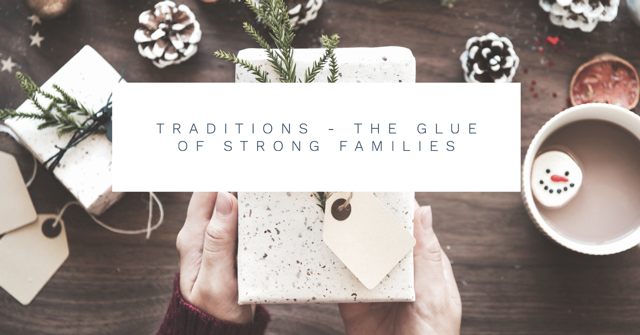 Traditions often play an important role in creating the opportunity for a shared, healthy, enjoyable activity that involved all the generations in a family, and develop positive relationships between generations that may have otherwise have difficulty connecting. The familiarity, the passing down of knowledge, the shared experience, the quiet conversation opportunities, these are often particularly enjoyed by the older generations and teenagers as a way to connect when it might feel there is little in common. But now, with many families spread across different countries or states, it can be difficult to get the time together to pass down, or take part in those once-familiar rituals. For example, indulging in special meals with family and friends, lighting holiday candles, gathering together to trim the Christmas tree, shopping for gifts, singing carols, attending a religious service…for many people these rituals have been practised year after year. For some families, they can represent traditional behaviours that have been repeated and treasured for generations. They are for many, what makes the festive season so special. As the generations change, rich traditions can be lost for any number of reasons. In my own family, I delighted in hiding the coin in my great-grandmothers Christmas pudding. I have vivid memories of watching her create this special food that was made just once a year, and available only on Christmas Day. By contrast, I have no idea what gifts she may have bought for me – and I’m sure there were many. What I do remember is the special shared experience of that tradition. And yet, as beautiful as these memories are, bringing back the rich smells of Christmas, of the laughter, flour and aprons in her kitchen, and despite the warm feeling of love that I feel when I recall those times, I have no idea how to cook a Christmas pudding. And although I am sad at the loss of this tradition, in truth, in today’s busy world it feels too challenging to continue this tradition – and perhaps that’s also because it is incredibly easy to pop down to the local Baker’s Delight and buy a Christmas pudding, beautifully wrapped, carefully crafted for taste. But as my son so beautifully put it when I baked a birthday cake for him which looked quite a bit less than perfect, (it was one of those moments when I wondered if I should just replace it with a cake from the store), “Mum, this is so good because I can taste the love”. It’s a beautiful phrase, used by him to describe just how much it meant that I’d taken the time to bake something meant for him. The creating of birthday cakes is our tradition, savoured by my family – not because my baking is a strength, but because of the love, the eagerly awaited ritual, the familiarity, and the linking together of years of repeated experience. It is not something that can be bought in the shops. In truth, I don’t remember whether my great-grandmother’s pudding recipe was actually any good – I just remember the love we shared in the moment. And that is the point of traditions – creating shared experiences and rituals that are familiar, treasured, special. As humans, we remember the special connections, the experiences of family traditions more so than toys or gifts. So although my baking skills may not be up to Christmas pudding, we have created Christmas traditions of our own, that suit our lifestyle. Finding suitable traditions is not always easy. Society is changing, the traditional family is changing. With a wide range of blended families, and with different cultures and religions blending together in today’s modern families, there can be the added challenge of a variety of opinions and feelings to take into account. And when our expectations are different from others, traditions can lose their joy, and instead cause conflict, disappointment, and resentment. It can become a challenge to hold tight to the long-held holiday traditions of your culture, religion or family of origin. And while it’s understandable why we hold so tight to these special memories, holding too tight can cause problems. If special times of the year cause more conflict and chaos than joy, it can be helpful to understand why. Sometimes the familiar behaviours we indulge in lead to predictable, unpleasant conflict. How might the introduction of a new ritual bring change? How might looking at the patterns of behaviour that replay every year help you discover how to change the pattern for a more peaceful outcome? What are the traditions of your childhood you have carried with you? Traditions form the structure of both our families and our societies. The rituals and behaviours we repeat remind us of our history. They shape our present moment and build a store of memories. What do you give yourself permission to let go of? To hold less tightly. And what do you hold tightly to? What will you take the time to indulge in, to immerse yourself and your loved ones in? The rich gift of traditions is yours to create. Choose from a special food to prepare or eat, a particular song or movie to watch, a place to visit, or an activity to complete. The most beautiful thing about family traditions is that they belong to you. Dr Amanda Mullin is a Doctor of Clinical Psychology, and the Director of Mindworx Psychology, an award-winning Clinical Psychology and Executive Coaching Practice based in Sydney, Australia. With a family of her own, a stellar career, and her own set of hurdles to jump, Dr Amanda understands the challenges faced in avoiding burnout and the search for positive mental health. Dr Amanda is the creator of the popular “Think Differently” program, with the big, fat, hairy, audacious goal to change lives for the better.